There’s no shortage of Japanese dining in Tanjong Pagar, and the yoko chou – 'eating district' in Japanese – now has a new sake-drinking spot. The sake menu is lean, and the busy kitchen hands don’t do justice for the exclusive bottles like the Dassai Junmaidaigin Jyo 50 ($17.80/shot, $22.80/160ml, $94.80/720ml) that Keisuke 'Ramen King' Takeda sometimes hand-carries into town. We're told how to order with the help of the 'sake meter' next to each bottle on the menu – negative numbers tell you how sweet, and positive digits how dry – then arbitrarily pointed to the Kamoshibito Kuhei Ji Jumaidaigin Jyo ($19.80/shot, $26.80/160ml, $108/720ml), because the 'zero' rating straddles dry and sweet. The sake-unacquainted will have better luck sticking to familiar stuff. Japanese beers such as Asahi ($9.80-$11.80) and Sapporo ($9.80) are available by the bottle, alongside cheap Tokyo-style sour shochu cocktails ($8.80) in flavours like Calpis and green tea. Japanese whisky ($6.80-$34.80/shot, $138-$188/ bottle) here includes familiar labels like Hibiki 12, Taketsuru 21 and the hyped-up Yamazaki 18. The snacks at Takeda Shoten easily double up as meals. 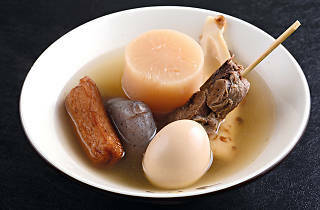 The chef’s signature creativity shows up in unique oden options like tender beef cheek ($4) and pork belly ($4), molten ramen eggs ($3) and melting nubs of beef tendon ($4). 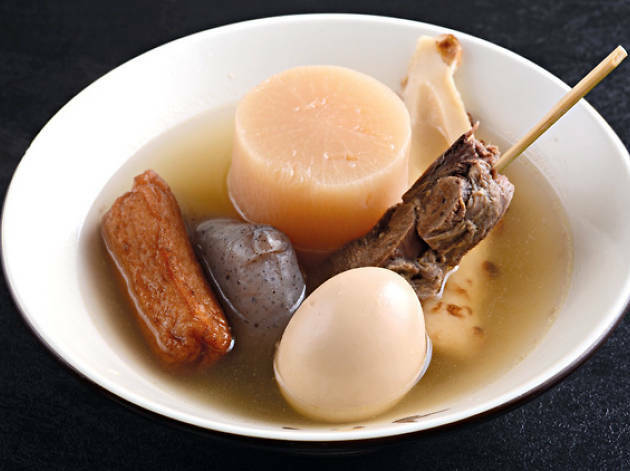 The broth itself is reminiscent of a homely Chinese pork bone soup. His other spins include misoflavoured grilled cream cheese ($9.80), which harks of Takeda’s French training, and a chewy green tea tofu ($6.80). The crisp rows of potstickers ($8) served up next door at Gyoza King can also be ordered. While the Ramen King has drawn mad success for his noodles, dumplings and rice bowls, the lack of friendliness and knowledge at this slower-paced izakaya casts a shadow on his otherwise gleaming portfolio of establishments.